and can dramatically change the quality of life of our patients". The next generation Total Ankle Replacement is one of those technologies that has proven itself to be worthy of that praise. 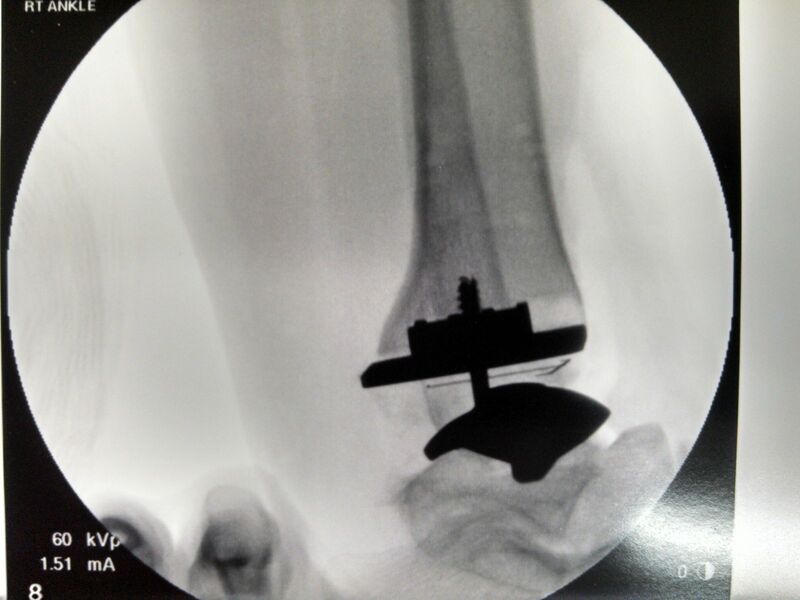 Total Ankle Replacement with Implant has been an option for quite some time. 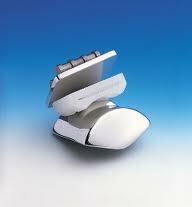 However, with the newer generation implants available on the market today, the long term outcomes are quite stunning. In the past, the gold standard procedure for severe ankle arthritis has been the Ankle Arthrodesis "Fusion". 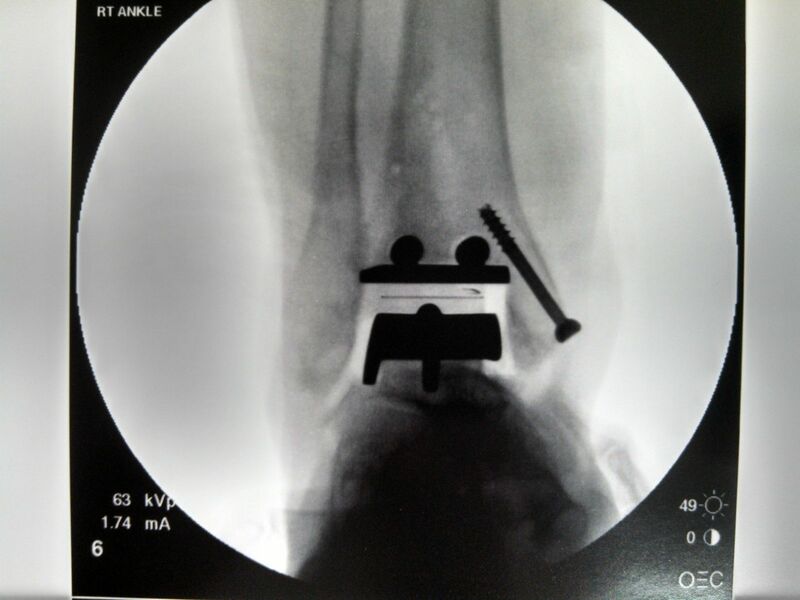 With this procedure, we essentially mend "fuse" the leg bone to the ankle bone with different types of hardware (screws, plates, halo frames, etc.) to eliminate the pain when walking The problem with this approach is that we lose the motion in the ankle joint and cause increased joint pressures on the adjacent joints thus increasing the risk of arthritis at those locations in the future. 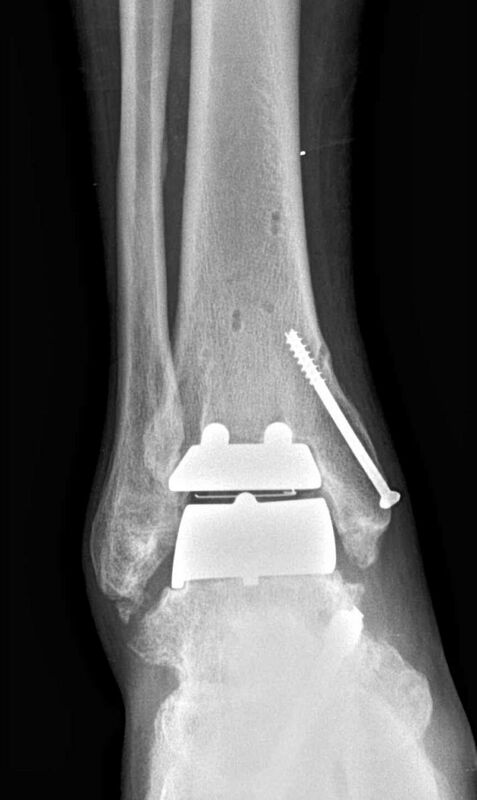 Additionally, the ankle arthrodesis can reduce the amount and quality of function for the patient. 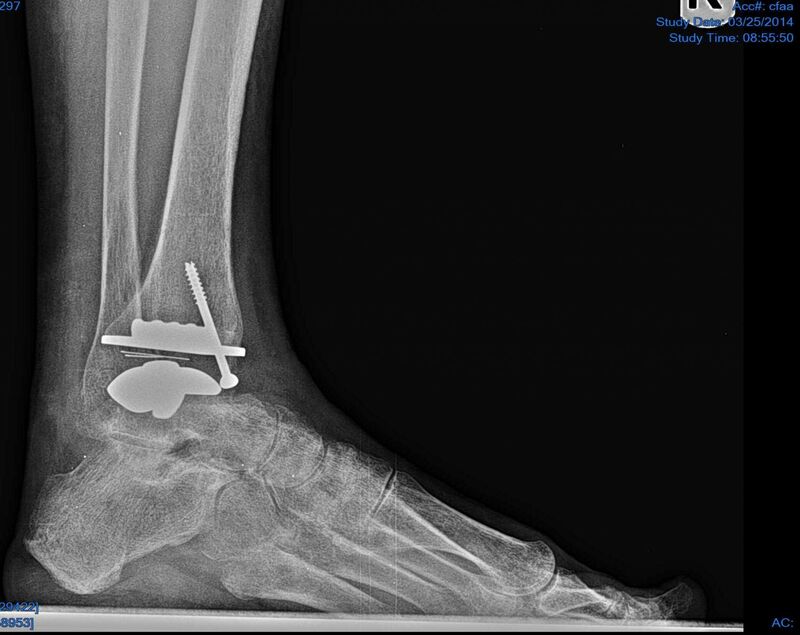 This procedure is still considered a great procedure in those patients that are not canidates for the ankle replacement. With our newer generation ankle implants, we are now able to offer a replacement of the ankle joint (similar to those of the knees and hips) that allows for continual motion, loss of pain and predictable long term outcomes. 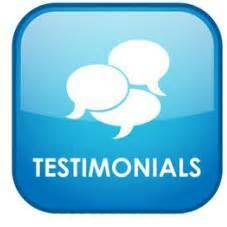 The success rates are quite excellent and exciting for patients! 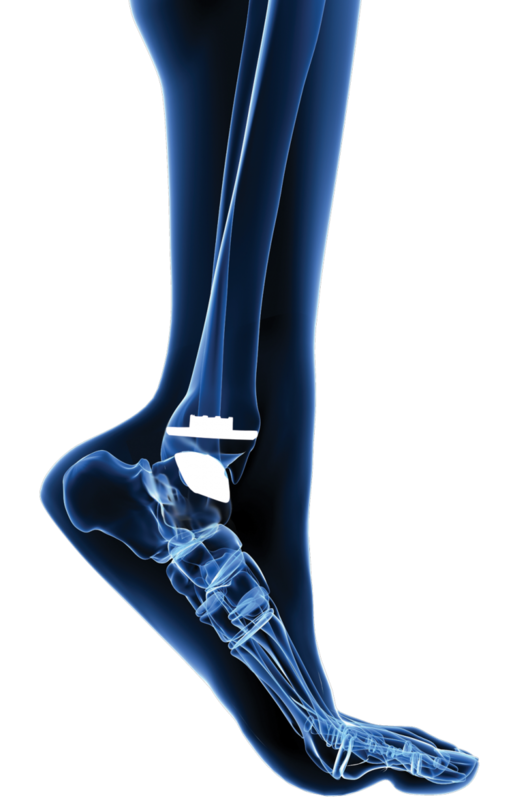 The typical ankle replacement consists of two smooth metal surfaces that reside on either side of the joint with a high molecular weight polyethelene spacer (medical-grade plastic) in between. This constuct allows for smooth motion, loss of pain, maintenance of lower impact function, and maintenance of quality of life. 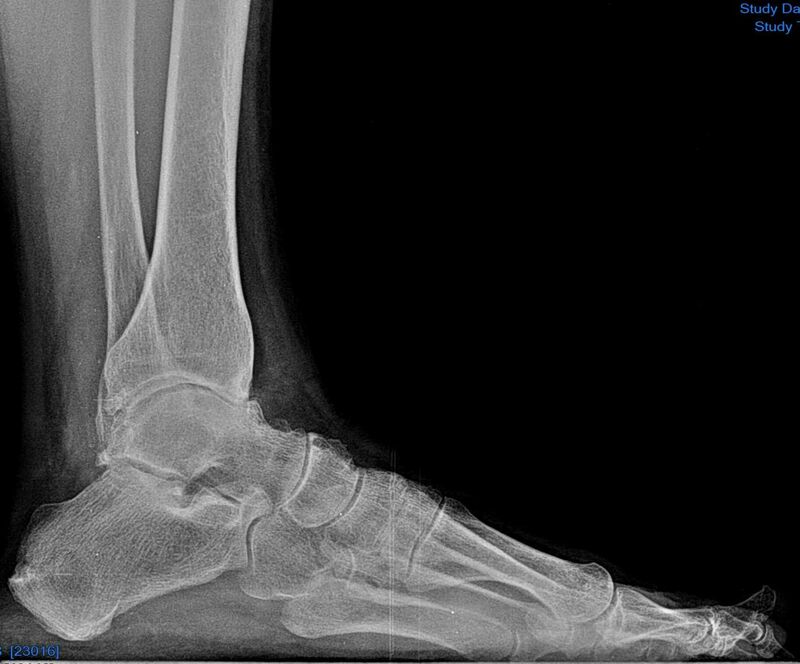 Even though we are able to offer this technique to our patients with severe debilitating arthritis, not all patients are canidates for this type of surgery and may still need an ankle arthrodesis. It should also be noted that there are many great conservative options for ankle arthritis that are non-surgical and less invasive. Below are some before and after pictures of our actual patients that have received ankle replacements by Dr. Moss. This site will continually be updated for additional information and pictures in the future. Return to normal activities !! !